You can see it in their eyes, even in the smallest of glances: Verna and Jerry Kinersly are soulmates. 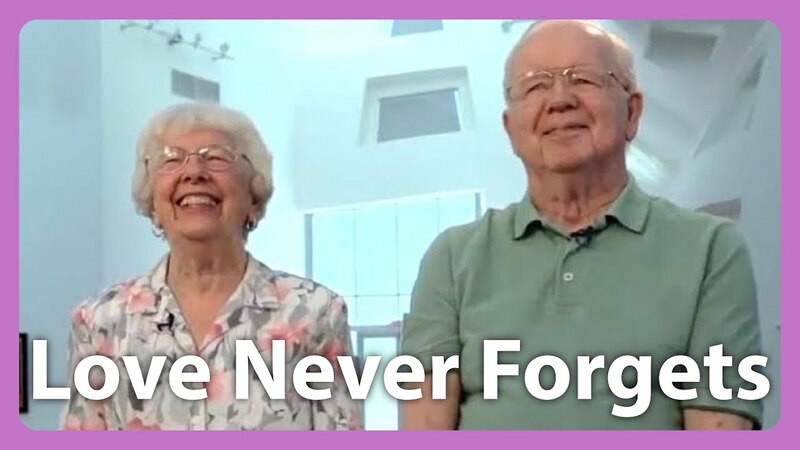 The couple, who married on Valentines Day in 1953, has endured the highs and lows of any relationship, though none has been quite so immediate and challenging as Verna's experience with Alzheimer's. Following her diagnosis, Jerry became his wife's caretaker. This ushered in a new era of their relationship, in which Verna leans a little more on her husband, though as you can see in the video above, she still has plenty of spirit. Jerry helps Verna stay grounded in the moment, by updating her "bulletin board" with the current date, sweet little notes, and other things to remember. Through Jerry, Verna is able to keep track of things like their beautiful family (two daughters, two sons, and grandchildren) and what they're doing day-to-day. Of course, some memories will always fade slightly—neither Verna nor Jerry could quite remember when they first kissed!—but Jerry gives a lot of credit to the center where they live for sustaining his and Verna's happiness and life together. "The luckiest thing that ever happened to us... is Larry Ruvo," Jerry says, speaking of the man who founded Keep Memory Alive, a center dedicated to patients with Alzheimer's and dementia. You can peek inside Keep Memory Alive in the video above, and you'll notice it's unique style—the building was designed by Frank Gehry! While Jerry and Verna continue to hope that a cure for Alzheimer's will be found, the couple lives in the moment and finds happiness in their partnership. "She's the love of my life, she's my best friend," Jerry says. "This has got to be the happiest ending you could have: 60 years!" And Verna puts it simply and sweetly: "I think I'm a very lucky person." Click here for more information about Keep Memory Alive and the Cleveland Clinic Lou Ruvo Center for Brain Health. For more stories like this, follow us on Facebook and sign up for our Only Good News Newsletter.